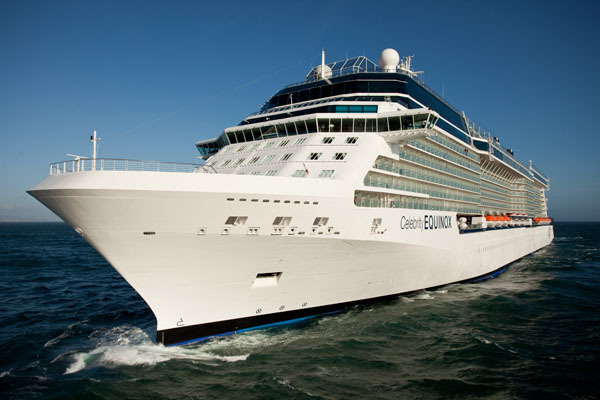 Prepare to embark on a fun-filled seafaring adventure aboard the Celebrity Equinox Cruise. 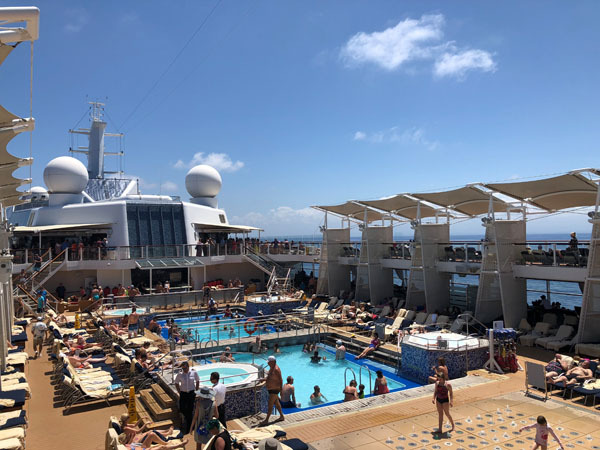 Though this premium ocean liner can accommodate up to 2800 guests, it also offers an abundance of entertainment and dining options to find your own solitude under the sun or a chance to join the party. Recharge in one of their luxurious accommodations that feature state-of-the-art amenities to recharge after a day of touring. Every room is outfitted with a smart Samsung flat-screen TV, private mini bar and complimentary 24-hour room service. One of the best ways to experience life on the water is in a veranda stateroom with a private en-suite balcony to take in breathtaking sunsets and sunrises or fall asleep to the lapping sounds of the waves. Live like a VIP in the suite-level rooms that offer enhanced amenities, exclusive dining options and European-style butler service. With over ten restaurants to choose from, there is something to satiate every palate with award-winning world-class chefs at the helm. Guests can opt for a specialty dining package to dine a la carte for an elevated dining experience. For an authentic Italian experience, the Tuscan Grill offers a sophisticated atmosphere with a charming rustic elegance. Classic Italian dishes are infused with a contemporary modern flair with fresh pastas, dry aged steaks and artisanal salumi on offer. If you are craving sushi and delicious modern Japanese fare, dine at Sushi on Five, which serves locally sourced seafood. Learn the art of sushi making from the master sushi chef at one of their cooking classes. For an elevated spa dining experience, guests can upgrade to the Aqua Class level for access to exclusive restaurants such as Blu. Their bold aesthetic is reflected in a modern dining room with a vibrant spa-inspired cuisine that features farm-to-table ingredients paired with biodynamic wines. One of the most beautiful restaurants on board is the elegant and sophisticated Luminae that is exclusively reserved for Suite Class guests and serves a globally inspired elevated dining menu. For fine French dining, opt for an evening at Murano. Intimate and romantic, classic French dishes are served in a beautiful dining room that exudes old-world charm. Other passengers who wish to partake in formal set dining can opt for the sprawling bi-level Silhouette restaurant with set dining times offering breathtaking ocean views. For casual dining with an alfresco patio, try the Oceanview Café buffet which serves an extensive selection of international dishes for breakfast, lunch and dinner. 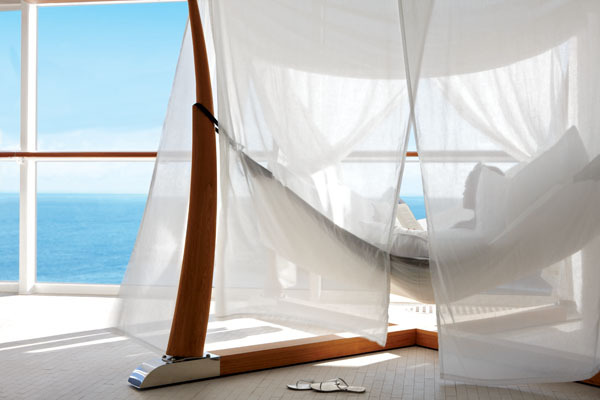 During the days at sea there are plenty of options, whether you want to relax and soak up some rays by the pool, hit the state-of-the-art gym, rejuvenate at the spa or have a day filled with activities. To recharge the mind and body, book a treatment at the Canyon Ranch Spa. Whether it’s a hot stone massage or anti-aging facial, the stress of the city will be blissfully left behind. Take some time to find your inner Zen in the Persian Garden while you lounge aboard heated stone chaise lounges in a peaceful holistic environment overlooking the expansive ocean. 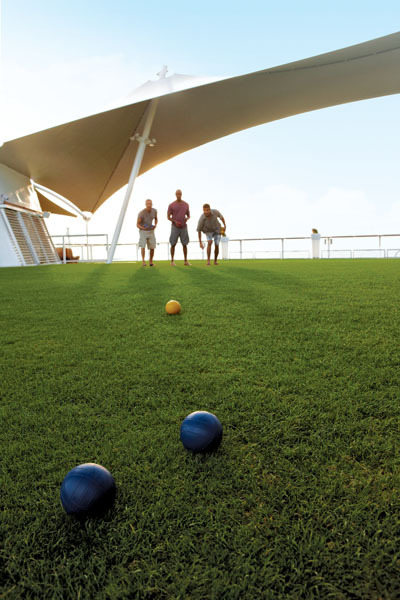 One of the things that set the Equinox ship apart is their half-acre lawn atop the sun deck. This expanse of greenery makes you feel like you are in a park surrounded by panoramic ocean views. Guests can play croquet, take a sunset or sunrise yoga class, enjoy an alfresco picnic with friends, or just sunbathe and take in the moment. Another fun option is their outdoor hot glassblowing class where master glassblowers will walk you through the process from start to finish. Try your hand at creating a customized vase, ribbon bowl or ornament to take home as a souvenir of your unforgettable journey. After dinner take in an electrifying show in the theater or dance the night away at one of the themed parties. The Silent Disco party is a sight to be seen with guests literally dancing to the beat of their own drum with selections from four different DJs. Rock your dancing shoes at the chic alfresco White Party with live entertainment and a renowned DJ. For a bespoke martini, stop by the Martini Bar & Crush where expert mixologists will wow you with their potent libations. Late-night partiers can dance until the wee hours at the Sky Observation Lounge, a quiet refuge offering expansive views overlooking the ocean by day and a hotspot at night. For a more traditional nightclub experience stop by Quasar which has a retro ’90s vibe for the after-hours crowd. While most of the sailings for the Celebrity Equinox are centered in the Caribbean, you can experience island life with one of their immersive excursions ranging from adventure to traditional sightseeing to charitable. On a recent visit to St. Martin, one of the highlights was the Chef Market Discovery of the Flavors of Marigot led by the Executive Celebrity Chef. We journeyed to the local food markets on the Dutch and French sides to shop for provisions for an intimate dinner to be prepared specially for the tour, and had lunch at a local celebrated restaurant. Another adrenaline-pumping excursion was the zip line adventure in St. Kitts as guests soared through the canopied rainforest at record speeds while admiring the island and ocean views. Whether it’s a romantic honeymoon, a friends or family getaway or multi-generational vacation, a trip aboard the Celebrity Equinox will leave lasting memories to be cherished for a lifetime.